German based KONAIR Flight School has hired FTDC which will provide the full set of ATO documentation according to EU-Regulation 1178/2011 and 290/2012. Furthermore, among the standard training manuals for their motorised aircraft operation (i.e. LAPL(A), PPL(A), NVFR(A) & Acrobatic Rating. Wiking Helikopter GmbH is an offshore AOC holder and an ATO providing services for offshore wind parks. In order to meet compliance demands of the German LBA and to further improve their daily operation Wiking hired FTDC to provide Ground Operations Manual for general activities and specific helicopter models, such as the Sikorsky S76 and the Augusta Westland AW139. The manual comprises the sections Passenger, Baggage and Cargo Handling Procedures as well as Load Control, Dangerous Goods and Security especially during off-shore sea operation. FTDC signs contract with Fliegerclub Nuernberg e.V. FTD Consulting signs contract for ATO approval documentation with Fliegerclub Nuernberg e.V. The aeroclub will use the tailored ATO documents in order to conduct LAPL, PPL and Aerobatics courses according to EASA-Regulation 1178/2011 and 290/2012. Will your airline be allowed to enter or leave Europe from November 26th 2014 onwards? The 6 month period started 26 May 2014 and ends with the deadline on 26 November 2014! Who needs a TCO authorisation? A TCO authorisation will not be required for operators only overflying the above mentioned territories without intended landing. For detailed information and support visit: http://www.ftd-consulting.com/TCO and sign up. German Private Jet Group AG has hired FTD Consulting for support of their intended ATO application. FTDC will provide necassary documentation according to EU-Regulation 1178/2011 and 290/2012. Furthermore, FTD Consulting will prvide application service and consulting services through the application process and coordinating the ATO approval with the approved AOC. GPJG is currently operating a fleet of Citation CJ2 525A and is providing business and private jet operations. Flylinz has signed a contract with FTD Consulting to support their current RF to ATO conversion. FTDC will provide the full set of ATO documentation according to EU-Regulation 1178/2011 and 290/2012. Furthermore, among the standard training manuals for their motorised aircraft operation (i.e. LAPL(A), PPL(A), NVFR(A), FTDC will provide En-Route IR (EIR) & Competency-based IR (CB IR) Manuals according to Regulation No. 245/2014. FTDC will prepare the manuals and suport Flylinz in the ongoing approval process. As it stands now, most of the Registered Facilities are hesitant to convert, as time frame seems long enough. We do sincerely hope, that more RFs will decide to convert into ATOs soon in order to avoid problems converting at the very last minute. The Aeroclub Lützellinden, a german based Registered Facility (RF) has asked FTD Consulting to support the RF-ATO conversion by providing PART-ORA documentation supplementing their already existent training manuals. FTDC has also reviewed the training manuals and has interfaced the 2 sets of documentation which are now being examined by the RP Kassel, Hesse, Germany. AeroStar Training Services LLC hires FTD Consulting to provide EASA documentation for their Type Training on A320 and B737. As FTDC has guided several training Organisations through the EASA approval process in Europe, AST is the second organisation which is supported outside the EASA member states. AST is a type training provider conducting training on FSTD only. CB IR & En-Route IFR (EIR) Distance Training Course & Manual available…. The CB IR & En-Route IFR (EIR) Distance Training follows the guidelines of the Training Manual and comprises 11 Training Modules. Each Training Module includes animated Web Based Training, Self assessment questions as well as a progress Test at the end of each module. The CB IR/EIR Training package includes the Web Based Training, colored testbooks and a question bank to prepare for the theoretical knowledge test. The distance training phase will require 72 hours of distance training, followed by 8 hours of classroom training at your ATO. At a planned training pace of 2 Modules per week, about 15 hours of studie time, the distance training can be finished within 5 weeks. the possibilities to monitor the students learning progress at any time. For more details and pricing information for Manuals and Web based Training Solutions, please contact us. FTD Consulting has signed a contract with Piper Germany for support in the conversion from JAR TRTO to EASA ATO according to Part-FCL/-ORA of the Commission Regulation (EU) Nr. 1178/2011. FTDC is taking over the update of all training manuals approved by the german LBA. The Norges Arktiske Universitet of Tromso and its dpeartment for aviation training, the School of Aviation (UTSA) has officially received ATO approval. FTD Consulting their ATO approval by adding the Organisation Management Manual (OMM) with integrated Safety Management System, Compliance Monitoring Program and Emergency Response Planning (ERP). For their FNPTII MCC, the Alsim ALX, FTDC had provided the FSTD Procedures Manual with integrated FSTD Compliance Management as required by PART-ORA of the Commission Regulation 1178/2012. 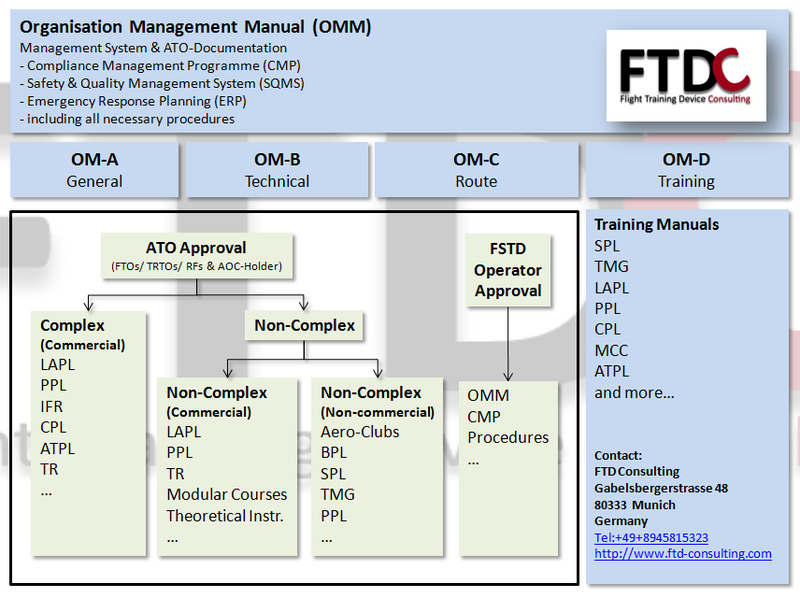 The Munich-based FTO MFA – Munich Flight Academy is supported by FTD Consulting in the conversion from FTO to EASA ATO according to Part-FCL/-ORA of the Commission regulation (EC) No. 1178/2011 & No. 290/2012. FTD Consulting will rework all manuals and guide MFA through the process if necessary. Naples Air Center is a flight school holding an independent EASA Approval administered by the UK Civil Aviation Authority. In order to maintain compliance, NAC has asked FTD Consulting to provide PART-ORA, PART-FCL documentation for all listed courses and to update the existing documentation according to Commission Regulation (EU) No 290/2012 dated 30th of March 2012 and Commission Regulation (EU) 1178/2011. With this project, FTD Consulting gets involved in a third country operator approval and continues to grow its expertise in the field of organisation approvals. Wiking Helikopter Service GmbH, a northern german based helicopter operator specialised in offshore operations and approved Type Rating Training Organisation (TRTO) has signed a contract with FTD Consulting for support in the conversion from JAR TRTO to EASA ATO. FTDC is currently checking on the existing documentation (Operations and Training Manuals) and will convert those into documents for EASA approval. FTDC will supplement the documentation with contents for the Organisation Management System and will focus especially on the requirements for the Safety Management System, the Compliance Monitoring Programme and the Emergency Response Planning. As the deadline for submitting your ATO approval documentation is coming closer, we would like to take the opportunity to stress the importance to deliver ATO approcal documentation according to PART-ORA of the Commission Regulation (EC) 1178/2012 before 8th of April 2015. This not only mandatory for FTOs & TRTOs and FSTD-Operators, but also for smaller flight schools (RFs) conducting engine powered flight training. For schools and aeroclubs conducting training on sailplanes and ballons, this deadline is extended until April 2015 depending on the respective requirements of their local CAA. Please get in contact with us to get documentation and support on your ATO approval. FTD Consulting would like to announce partnership with the austrian company InfoWerk Multimedia GmbH. The cooperation agreement was signed between the CEO Hans-Jörg Lotter and the Managing Director of FTDC Alexander Schaffler at the EATS – European Airlines Training Symposium in Berlin in November 2013. FTDC has the right to market InfoWerk products world-wide on a non-exclusive contract. Focus is laid on aviation products in particular, such as Learning Management Systems for Flight Crew Licensing and Maintenance Training apart from many other solutions offered for ATOs. The Norges Arktiske Universitet of Tromso, better say the School of Aviation (UTSA) has signed a contract with FTD Consulting in order to get support to provide ATO documentation for their intended ATO approval. The university is operating an FTO providing ATPL(A) courses on Cessna 182. As the university has already parts of the documentation (i.e. the Operation Manuals) in place, so FTD Consulting advised to add the Organisation Management Manual (OMM) with integrated Safety Management System & Compliance Monitoring Program. As the university recently purchased an Alsim ALX, FTDC is also providing the FSTD Procedures Manual with integrated FSTD Compliance Management as required by PART-ORA of the Commission Regulation 1178/2012. of 30 March 2012 amending Regulation (EU) No 1178/2011. It incorporates all procedures necessary to operate the SMS. Risk identification, risk assessment and mitigation as well as other procedures, e.g. management of change, continuous Improvement, to name just a few are included. Furthermore, the SMS is accompanied by the ERP (Emergency Response Planning) which takes care of any major incidents within the organisation, such as major accidents with fatalities. FTD Consulting provides Safety Management Manuals and other ATO and AOC related documentation required to meet the current EASA standards. ATO-Approval.com – According to our earlier posts, you might have recognised that FTD Consulting is currently addressing several ATO approvals for complex & non-complex organisation according to Commission Regulation (EU) No 290/2012 date 30th of March 2012, an amendment of the former Commission Regulation (EU) 1178/2011. In this post we would like to share some details with you, how the new set of documentation is structured. If you have been operating an FTO or TRTO, you will be familiar with the set of Operations Manuals A to D with the respective information. These might well be accompanied by other manuals, such as Quality Manuals and the CAME if you operate it in-house. If you have never been an FTO or TRTO and beling to the flight school operators, the former registered facilities (RF), then this post is especially for you, but not only for you, as even for FTOs/ TRTOs, there are a lot of changes, which most won´t anticipate. If you already have an existing quality documentation and plan to amend that to the new standard, this effort is in vain as you have to re-write the whole manual and add a good number of pages. We did that with an existing FTO quality manual and found it a lot of work. If you have a none existent doumentation as you never applied for an ATO or you are a registered facility, you will drown in work as there are 10 documents comprising a 1000 pages to write and to compile according to the required EASA standards. “But what can we do?”, you might think. Well, either you follow the instructions of PART-ORA.GEN and ORA.ATO for the management system documentation and get one, two or three skilled employees to work several months on it or you inquire with us via our project website ATO-approval. We offer not only a complete set of EASA-compliant documentation, but also consulting services for your flight school. FTD Consulting has signed a contract for an ATO-Approval with the LVB – Luftsport-Verband Bayern e.V. a non-profit organisation & registered facility (RF) , which is the head of about 130 associated aviation clubs providing flight training in the private pilot sector. The organisation is intended to become a Non-Complex Approved Training Organisation (ATO) under the supervision of the Luftamt Südbayern, the aviation authority for South Bavaria & Munich, Germany. FTDC is to provide a specialised set of ATO documents for all members/ branches of the ATO, ergo every member of the organisation will conduct training as predetermined by the LVB and FTD Consulting and will use the respective Operations Manuals (OMA-D) including the required Management System Documentation (with Safety & Compliance Monitoring). Intended main areas for providing documentation, among other associated license types, are Balloon Pilot License (BPL), Sailplane Pilot License (SPL), Leisure Aircraft Pilot License (LAPL), Private Pilot License (PPL), Touring Motor Glider/ motorised sail planes (TMG) and licenses for single-engine piston aircraft (SEP) aircraft as well as their instructor ratings. After completion of the project, a standard set of documentation can be purchase with the LVB in cooperation with FTD Consulting, providing an EASA-approved set of documents for registered facilities and future Non-Complex ATOs.